Although these women’s efforts proved futile, their persistence and passion still resonate today. By insisting that all citizens – even women, who did not yet have the right to vote – could and should participate in the highest levels of politics, they helped create a civic culture of engaged citizenship that continues to inform American politics today. The idea of arbitrating World War I may seem naive in hindsight. Yet for nearly three years, numerous pacifist groups and individuals in both the United States and Europe advanced proposals for neutral mediation. Proponents of international mediation hoped diplomatic intervention could bring the war to a swift end and prevent additional loss of life. They also hoped to pave the way for a new type of diplomacy, based on international law and voluntary arbitration, that would ensure lasting peace. Henry Ford collaborated with Hungarian feminist pacifist Rosika Schwimmer to charter a “Peace Ship” to take a private delegation to Europe to broker peace talks. The “Peace Ship” attracted media attention. However, my research on Sophonisba Breckinridge, a founding member of the Woman’s Peace Party, suggests that Breckinridge and other members of this feminist pacifist organization – including future Nobel Laureates Jane Addams and Emily Greene Balch – had a more lasting impact. While not the first or the only peace organization in the United States, the Woman’s Peace Party, founded in January 1915, was distinctive in its focus on “peace as a women’s issue.” Believing that women’s full participation in the political process was essential to ending global conflict, members of the Woman’s Peace Party worked for both women’s rights and world peace. Women brought a unique perspective to international relations. Pointing out that women suffered disproportionately in wartime, foreign relations feminists sought greater influence in foreign affairs even though they were denied the right to vote at home. Ultimately, feminist pacifists hoped to create “a world without war.” As a step in this direction, the Woman’s Peace Party endorsed the mediation movement. International Congress of Women at The Hague. Over 1,000 delegates from 12 countries – including the belligerent nations of Germany, Italy and Great Britain – protested “the madness and the horror of war.” They pointed out the dangers war posed to women, including sexual assault. Feminist pacifists envisioned a peaceful world that included national self-determination, universal disarmament and free trade. It also required equal political rights for women. Following the Congress, two delegations made a total of 35 visits to political and religious leaders of both neutral and belligerent nations to promote peaceful solutions to the ongoing war. While the women did not achieve any concrete results, they were cordially received everywhere they went. Addams reflected: “Perhaps the ministers talked freely to us because we were so absolutely unofficial.” They returned to their home countries more determined than ever to promote neutral mediation of the ongoing conflict. Back in the United States, representatives of the Woman’s Peace Party maintained steady pressure on President Woodrow Wilson to initiate peace talks. The president had made some overtures at mediation at the war’s outset but had been rebuffed. However, Wilson’s willingness to meet with peace advocates and his praise for women’s proposals at The Hague encouraged them to continue their efforts. The group included Breckinridge, who held advanced degrees in political science and law. Speaking on behalf of “all the women in the country,” Breckinridge urged the committee to apply “reasoning and justice” to international affairs. Breckinridge’s testimony displayed her familiarity with political theory, supporting her contention that American women were informed and intelligent citizens who deserved a voice in the government. She also indicated that feminist pacifists were determined to have a say about foreign policy. In particular, she highlighted their interest in a “world organization” to prevent future wars. Despite their best efforts, American pacifists were unable either to halt the ongoing war or to prevent the United States’ entry into it. Proponents of mediation seemed on the brink of success in early 1917, when Wilson delivered his “peace without victory” speech in the U.S. Senate. Ironically, just a few weeks later, in response to German submarine warfare, Wilson asked Congress for a declaration of war. Although their mediation campaign did not achieve its immediate aims, women’s “citizen diplomacy” during World War I left an indelible mark on international relations. Feminist pacifists also established a precedent for women’s leadership in political protest. Peace activists continued their work, whether by attempting to outlaw warfare itself or by protesting nuclear power plants. Women also assumed leadership positions in the anti-lynching and civil rights movements. More recently, women have been at the forefront of the Standing Rock protests and the Black Lives Matter movement. And, of course, women organized the Women’s March on Washington, perhaps the largest mass protest in American history. The pink “pussyhat” on the cover of Time magazine in a February 2017 issue dedicated to “the resistance” highlights the continuity between women’s political activism in the past and present. 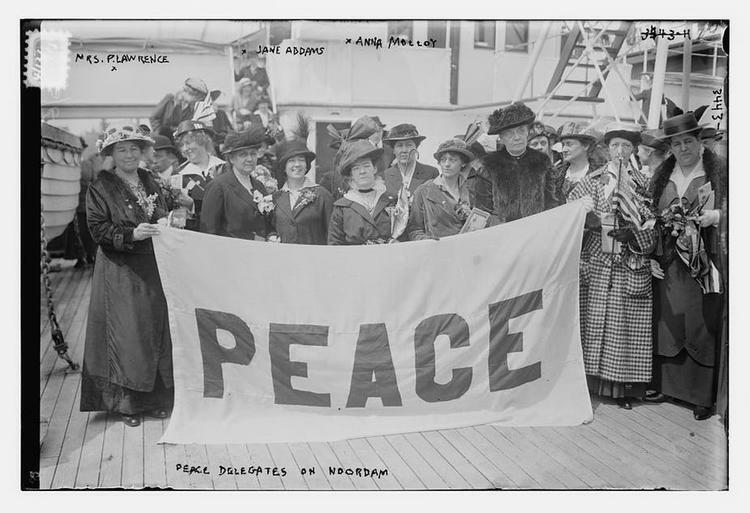 Featured Photo: Peace Delegates on the Noordam – Mrs. P. Lawrence, Jane Addams, Anna Molloy.